Phoenix Dental Implants | Peck Family Dentistry, P.C. There are several options for replacing missing teeth and one of the most popular ways is dental implants. A huge reason patients are having implants placed is because they feel natural and like your own. There are two parts to a dental implant. A titanium tooth root is surgically placed in the jawbone and overtime the bone grows around the root bonding the implant in place called osseointegration. After the healing process, a porcelain crown is attached onto the root form. We will have an oral surgeon place the tooth root in your jaw and Dr. Hillary Peck will place your dental crown. Your implant will feel and look natural and blend in well with your existing teeth. With good oral health dental implants are a permanent resolution for missing teeth. They are very sturdy, strong, and long lasting and can even be used to stabilize a denture. They are hassle-free compared to a removable dental appliance. Chewing effectiveness is greatly improved. Your friends won’t even notice you have an implant. One of the disadvantages of having a dental implant is that it can take up to six months for the entire process to be complete. The jaw bone needs time to heal and bond with the tooth root. They are also more expensive then dental bridges or removable dental appliances. While an upper denture stays in place from suction a lower denture sits on the ridge of the lower jaw using the tongue and cheeks to try and keep it in place. Usually dentures rest on the soft tissue so generally there is some movement and slippage while chewing and speaking. This is much more noticeable with a lower denture. To keep a denture from moving around dental adhesives are used to help stabilize them which are messy and unpleasant. Even with the best fitting denture chewing effectiveness is always reduced. When a poorly fitting denture is in place, some people have to change their diets to soft foods which can affect their overall health. There are times when chewing foods becomes so difficult that people just stop wearing them. Over time, sores can start to develop in the mouth from the denture which is painful. This happens because the jawbone shrinks over the years from missing teeth and the ridge on the lower jaw becomes sharper causing these sore spots to develop from the denture. The biggest problem with dentures is bone resorption, in other words, shrinkage of the jawbone. The body knows when there is no teeth left so it resorbs the bone in the jaw and takes those minerals to other areas of the body. This is the main reason that dentures become more difficult to wear after a while as well as making one look older than they actually are. When a denture becomes impossible to wear because the bone has resorbed greatly this condition is called facial collapse. Please call our office for a consultation to see if you are a good candidate for dental implants. If you are unsure about the procedure and just have some questions we would be happy to see you and meet us personally. 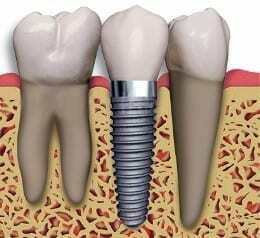 Those that qualify are in good general health and have plenty of bone present to place the implant. Good oral hygiene habits are vital in the success of a dental implant therefore regular dental cleanings, check-ups, and home care will help you keep your smile beautiful for years to come. Give us a call at 602-867-1398.